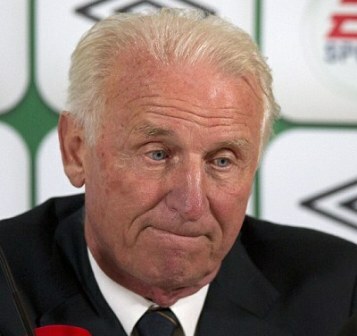 Former Ireland boss Giovanni Trapattoni. Many years ago the sports editor of a very well respected broadsheet newspaper offered some words of advice at the wash basin in the toilet of a Dublin pub – move to a bigger paper, and one with bigger words. At the time I was the soccer correspondent for the Irish Daily Star and a bit of a young pup in an industry that had been populated by, shall we say, more elderly men. The newspaper industry in Ireland was only waking up to change and there I was, working on a tabloid and proud of it. We used short words where this man’s paper used long words that sometimes necessitated the use of a dictionary or a thesaurus – or both. His point -- after he had washed his hands I might add -- was that broadsheets were where it was at for those with serious ideas about themselves as sports writers. And he probably had a point on a night when we enjoyed more than one pint of a different nature. Thankfully I have never had serious ideas about myself. I am still getting paid to write, talk and survey sport, and if you’d told me that would still be possible 30 odd years ago when I was starting off in the Meath Chronicle – a broadsheet by the way – I’d have happily shaken hands on the deal there and then. The tabloid world has suited me just fine since those early days and, one famous row aside, there’s nothing in my time on newspapers since that causes me anxiety or sleepless nights. I like the fact that I work and have worked for newspapers that talk to the ordinary man and woman on the street. I like the fact that my current home, the Irish Sun, treats soccer and hurling and Gaelic football with the same reverence if offers to affairs of the state or the heart. Soccer is a big thing in my life and a big thing on the paper where I now work. To borrow one of our marketing catchphrases – we love it. The fact that we are probably about to outsell the broadsheet whose editor offered those words of advice all those years ago is neither here nor there. His paper is a rugby paper and a GAA paper before it is ever considered a soccer paper by the rank and file of the Green Army, and good luck to it. We live in a different world. Soccer means something to the Irish Sun reader and, I am glad to report, to every single man and woman who works with us. That’s why the past week has been exhilarating, exciting, busy – and sad. There are times in this job when the stories just present themselves. Nine times out of 10 in the tabloid world those stories center on soccer and as often as not in our particular parish, they concentrate on the Irish national team. My regular reader knows that the Ireland team is a subject very close to my heart. As long as I’ve wanted to be a journalist I’ve been an Ireland fan. As long as I’ve been alive – and it’s a long time now I’ll admit – soccer has been my main game. Even now, as golf runs it close, my passions are aroused whenever that green jersey appears on the pitch and “Amhran na bhFiann” fills the air, even when it’s as awful as the Nadia Forde version at Lansdowne Road last Friday night. I care about the Ireland team. I am passionate about Irish football. I love it as the earlier saying goes. I am also realistic about it. And I call it as it is. That’s why events of the last week have been difficult to say the least for those of us who care about Irish football and work in the media as Team Ireland implodes and the inevitable parting of the ways with Giovanni Trapattoni looms on the horizon. Ireland were brutal against Sweden at the Aviva Stadium last Friday night. They lost 2-1 and deserved to lose. They haven’t beaten any qualifier rival other than Armenia in World Cup or European Championship games under Trapattoni. We haven’t beaten a serious team away from home in a competitive game since we beat Scotland 1-0 at Hampden Park in 1987 – when I stood on the terrace as a fee paying fan. We are bereft of attacking ideas, stuck in an Italian defensive mold and going nowhere fast, never mind Brazil for the World Cup finals next summer. That explains why my professional life involved obituary writing and headlines for the Trapattoni era on Friday night and all weekend. It explains why Monday was spent working on headlines and angles ahead of the game away to Austria on Tuesday night. And it explains why we have already worked out every pun ahead of the game – I am writing this column just hours before kickoff and expecting the worst. We’ve used them already or have them in the pipeline, although I have to admit we’re only working on negative headlines such is the current state of this Irish team. They’re easy lines too. Goodnight Vienna. Ah Vienna – it means nothing to me for those of you who remember Ultravox. Heaven Alp Us. Aus-terity strikes again. Gio now in the name of Rio. The Gone-Trapps. They are all puns, some of them terrible I will admit. None of them would work in a broadsheet. They all work in a fun loving tabloid like the Irish Sun. That’s why I’m glad I never listen to men in toilets! A COLLEAGUE remarked the other day that Davy Fitzgerald must be the most revered man in Irish sport, and he may well be right. No sooner had the All-Ireland hurling final reached an incredible conclusion – and a draw – on Sunday that Davy was again claiming on national television that his team are victims of some incredible victimisation campaign. This time it’s the refs that have it in for Clare, and for Davy and most times it’s the refs who seem to bear the brunt of his ire. He’s a man with a persecution complex, and it doesn’t do him any favors in the popularity poles. But maybe that’s the point. Maybe all the “small fish don’t get the breaks” remarks are designed to shift the focus of attention onto Davy and away from his young team, youngsters who hurled beyond their years on Sunday in a game against Cork which they should have won. Vincent Hogan, the great Irish Independent journalist who knows his hurling better than most in our industry, swears by Davy. He likes him as a guy, respects him as a coach and thinks there may be seem credence to the theory that it is all an act to keep the pressure off his players. He also says the Clare and Waterford players who have worked with Davy say he is calmness personified inside the dressing room. I’m starting to side with Vincent on this one. Whatever about his rants off the field, Davy Fitzgerald has performed miracles with this Clare team this season. They should have won the All-Ireland hurling final last Sunday when the great players from Kilkenny and Galway and Tipperary were sitting in the stands or on their couches watching it all. They will take great heart and confidence from running Cork off the pitch for many of the 73 minutes played at Croke Park last Sunday. And they will go into the replay – at 5 p.m. on Saturday, September 28 – believing that they can win the MacCarthy Cup because that is what their manager Davy Fitzgerald wants them to believe and will ensure they believe. He may be mouthy and opinionated and convinced he is persecuted, but Davy Fitz is also a winner. And that’s all that really matters on a September Sunday in Croke Park. CORK thought they had the All-Ireland hurling final won when Clare defender Domhnall O’Donovan crossed the halfway line in the final seconds of added time – and scored his first ever championship point. When asked what he thought when he saw O’Donovan for a score, boss Davy Fitz said, “You don’t want to f***ing know.” O’Donovan usually missed in training but he pointed his way into history on Sunday. GIOVANNI Trapattoni’s record as a football manager is exemplary but it belongs in the history books, not in the Irish dressing room. On Monday he claimed that he is worth another two year contract as Ireland manager and insisted he has done not a good job with Ireland, but a great job. The man is delusional and the sooner he goes, the better.